The fight against AIDS is far from over. In countries where Doctors with Africa CUAMM operates, one person still dies every three minutes because of the virus. CUAMM seeks to control the epidemic on many levels, both in hospitals and in communities: last year, 27,000 people were tested in Uganda and more than 10,000 in Ethiopia. 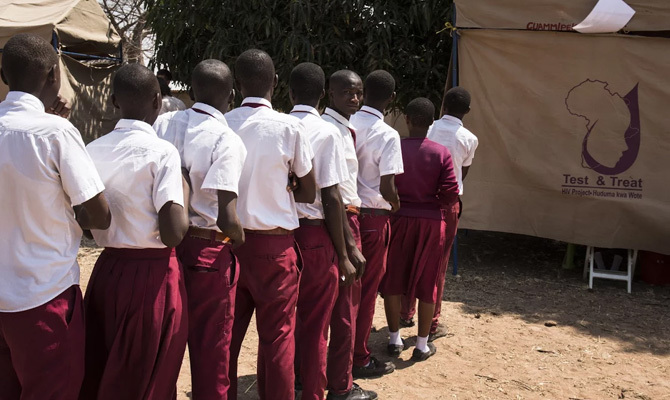 In Tanzania and Mozambique, CUAMM is taking a particularly innovative approach to the biggest challenges AIDS poses: ensuring everyone access to drugs and paying special attention to adolescents, one of the most at-risk groups. In Tanzania, the Test and Treat project gives free HIV tests to the entire community in the two regions part of the project and if the tests are positive immediately starts treatment, as suggested by new WHO guidelines. CUAMM also offers a decentralized system to be able to treat those who live in rural areas, making it harder to get to health facilities. Based on this approach, CUAMM aims to test 300,000 people in five years and treat 20,000. Thanks to the support of Gilead Sciences, 52,200 people have already been tested, 2.2% of whom tested positive. In Beira, Mozambique, efforts have focused on convincing adolescents to get tested. CUAMM is working with the Elton John Aids Foundation, ELMA Philanthropies and ViiV Healthcare in youth centers in Saaj, where youth can get information on how to handle their important health issues, of course including managing sexuality and the risks of contracting HIV. In the first year of the project, started in August 2016, over 86,000 young men and women accessed the service and, for 55,500 of them, this was the first time they had discussed these issues. Though results so far have been highly encouraging, awareness-raising needs to continue to be consistent and far-reaching. For World AIDS Day on December 1st, CUAMM staff have upped their efforts, working in partnership with local governments and communities to organize awareness-raising events and give people a chance to get tested. Two large parades will wind through the streets of Shinyanga (Tanzania) and Beira (Mozambique), involving government and health authorities, community and religious leaders, schools, and young people, to inform people, encourage them to get tested, and try to reduce the social stigma associated with this disease everywhere. Other testing campaigns will be organized at sports tournaments, plays, at healthcare facilities and in the community, and our staff will take part in radio and television programs, all with the aim of reaching as many people as possible. On this day, CUAMM is reaffirming its commitment to keep focus on AIDS, supporting awareness and prevention campaigns, especially among young people, and ensuring access for all to drugs that can now let HIV-positive people lead a normal life. Follow news from World AIDS Day on Doctors with Africa CUAMM’s Facebook and Instagram pages.